Neutral tones act as the perfect backdrop for wood elements as well as shiny tiles, nubby linens, and even brushed velvets. 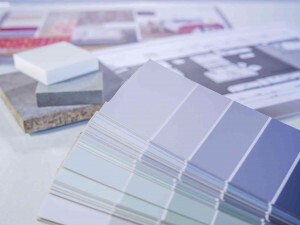 When it comes to choosing paint colors for the interior of your home, many homeowners get stuck with all the available options. Should each room have its own theme? Should all the rooms match? Should you consider painting a feature wall? With all these options, it’s understandable that a project that should be a lot of fun can turn into a stressful endeavor. There are many reasons to consider how your design would benefit from using a neutral scheme. Here are the reasons why a neutral color scheme is perfect for your home’s interior. Many people believe that neutral tones are boring and dull. However, if you change your way of thinking about neutral colors, you’ll see how you can use them to highlight the furnishings and texture in the space. Neutral tones act as the perfect backdrop for wood elements as well as shiny tiles, nubby linens, and even brushed velvets. In rooms that are painted with bright colors, the walls take center stage, but when you turn down the volume on the walls, it brings up the intensity of those other elements. Trends of bold and bright colors come and go. By the time you actually get a popular color on your walls, the interior design industry has likely already moved on to discover what’s going to be new and popular for the upcoming season. Neutral color schemes never get old. In fact, they become more and more stately over the years. They add sophistication to every room design and elevate the level of style. It’s a subtle yet classic look that will allow you to use it as a platform for many other design choices. With a neutral color scheme on the walls, you have more opportunities to bring more color into the room with your furniture, drapery, and other accessories. When you use it as a backdrop, you can bring in more colorful elements in a way that won’t contrast with the colors on the walls. Try working with patterned pillows, a colorful bookshelf, and other accessories. Columbia Paint Company is happy to help you choose the perfect color for your painting project and offer you tips for every step of the way. Not sure how to make sure your siding, trim, and accent colors match? Need to see the paints you loved online in person? Schedule an appointment today by calling 443-319-4001 or visiting us online. For more painting tips and updates, follow us on Facebook, Twitter, Google+, LinkedIn,Houzz, YouTube, and Pinterest!